NHM UP Laboratory Technician Syllabus 2018 Check Written Exam Model Papers of NHM Lab Technican. More details of NHM LT Syllabus, NHM UP OT Technician is given with expected written exam paper. DBRAU Admit Card 2018 Check Latest News of Agra University Back Paper Exam Date, DBRAU Regular Exams Admit card of 1st, 2nd and 3rd Year exam date of Agra University. UP ICDS Anganwadi Recruitment 2018 Apply Online For 31000 vacancies of Anganwadi Assistant and Anganwadi Helper Bhartin UP. Minimum 10th Pass will fill UP 31,000 Aganwadi Recruitment 2018. ERDO Bihar BTT Recruitment 2018 Apply Online for ERDO Bihar 13634 BTT Recruitment 2018, ERDO DEC BEC BTT Recruitment 2018 in ERDO Teaching 13634 Jobs Bihar. We will later on update more details about admit card, syllabus and Joining or appointment letter. UP Police Horse Rider Recruitment 2018 which is an Organization of Uttar Pradesh 102 Police Recruitment 2018 has invited for Constable Horse Rider. With Leading Document and support of webiste you can apply as 102 Constable Horse Rider Vacancies. UPPSC Medical Officer Recruitment 2018 Apply Online for AMO UPPSC 2354 Allopathic Medical Officer Recruitment 2018 , AMO Jobs in UP, Unani Doctor Jobs and Medical Lecturer Pravakta in Medical College. UPPSC AMO Allopathic Medical Officer Recruitment 2018 Online Apply. 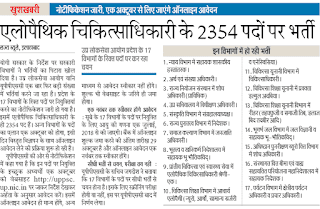 NHM UP OT Technician Recruitment 2018 Apply Online For NHM UP 44 Operation Theatre and NHM UP 148 Lab Technician Recruitment 2018. Before Closing Date of UP Operation Theatre Technician Recruitment 2018 check here. NHM UP Staff Nurse Cut off Marks 2018:After screening/ scrutinizing process all eligible candidates based on the Tour shall be invited for a written test examination. Minimum qualifying marks for the written test shall be as follows. Please visit www.upnrhm.gov.inor www.sams.co.infor detailed JDs and information regarding eligibility, salary and age criteria for each post. 11th Class Online Admission Form 2019 in Government Schools Apply Online to Check CBSE School 11th registration Form 2018, School Admission in Class 11TH will be started from May, June 2018 in Chandigarh, BHU, Pune School and Kolkata Convent School which runs under English Medium.